Modern cards, especially those released in the past ten years to the present, are full of multi-player combinations. That includes modern players with past players, teammates, non-teammates, and every combination in between. However, multi-player cards weren't part of a normal set until the mid-1950's. Some of the first multi-player cards come from the attractive 1953 Bowman color set. Although Bowman released a small set that year, they did include several multi-player cards. 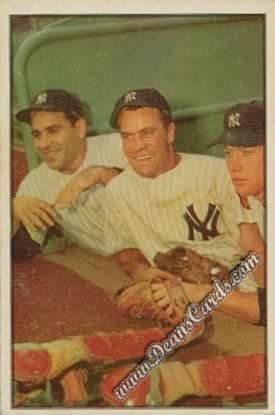 One of the most popular is #44 Mickey Mantle/Hank Bauer/Yogi Berra. The Bowman Gum Company picked a great team for both of the multi-player cards that year (the other was #93 Billy Martin & Phil Rizzuto). The Yankees would win the World Series every year from 1949 to 1953. Topps issued its first multi-player card in 1954. 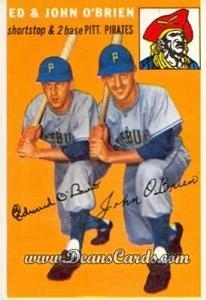 Card #139 features brothers John and Ed O’Brien, the shortstop and second baseman for the Pirates. Unfortunately for the O'Brien brothers, the Pirates finished last in the NL with a dismal record of 50-104. The O'Brien brothers would both be out of baseball by 1959, but they will always be remembered as the first Topps multi-player card. In 1957, Topps really got the hang of multi-player cards and one of their best was the #400 Dodgers' Sluggers card, featuring Carl Furillo, Gil Hodges, Roy Campanella, and Duke Snider. In the two years prior to the release of the 1957 Topps set, the Brooklyn Dodgers had made two World Series appearances, winning one in 1956. 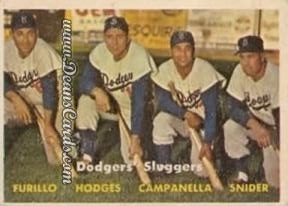 Although the Dodgers would be best remembered as a team with outstanding pitching, this unique multi-player card accounted for a total of 116 home runs in 1956. Please click here to view all of our 1950's singles cards.